The results of Consulting’s annual Executive Outlook are in—and the numbers are looking good. Really good. 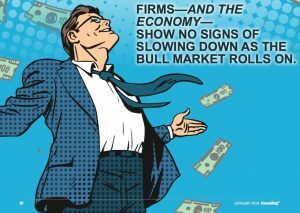 While the economy hums along, consulting firms are doing their very best to take full advantage of the momentum while the going—and growing—is good. Pipelines remain strong and firms are still in the midst of a hiring frenzy as they need those human resources to get all the work done. Let the good times roll would seem to be the mantra for 2018 based on the results of Consulting magazine’s annual Executive Outlook Survey.